In medium bowl, combine bison, crackers, cilantro, egg white, salt, black pepper and garlic. Mix until well blended. Shape into 8 large meatballs. 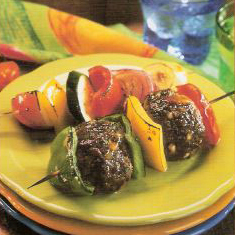 To prepare a skewer: alternate 4 bell pepper squares and 2 meatballs per skewer. Repeat process making 4 skewers. Barbecue bison and vegetable skewers for 5 min. Turn, baste bison skewers with a spicy barbecue sauce and grill 4-5 min. longer or until done. Baste vegetable skewers with flavored oil and grill 5-7 min. longer or until tender. Serve. Preparation time: 20 min. Cooking time: 10-12 min.